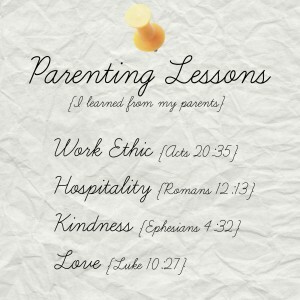 Hopefully you have parents that you could positively learn from. However, parents are human and they will make mistakes. I pray daily for my own wisdom as a parent, and that my girls will forgive me when I don’t quite get it right. I hope they will want to mold their own parenting ideals around how they were raised. I know I look up to my parents and how they brought me up. I have wonderful parents that I deeply love and adore. Let me start with my mom. She helped provide for our family by teaching piano lessons. She showed me how to love people. My friends always felt welcome in our home and it was largely because of my mom’s hospitality. She always treated others as special guests in our home. I have learned from my dad what true work ethic is. He worked hard to provide for our family. He will do anything for me or my sister. We are his world. I know how special he makes me feel and I want my own girls to have my full attention. I want to light the way for my girls to succeed in life like my own parents have. I want them to see how much their parents are in love with each other. I want them to feel as loved as they are. I want them to see the love I have for my Savior.